This article is about the league founded in 2013. For the previous league of the same name, see Big East Conference (1979–2013). For that league's football successor, see American Athletic Conference. The Big East Conference (stylized as BIG EAST) is a collegiate athletic conference that competes in NCAA Division I in all sports except football, which is not sponsored. The conference has been officially recognized as a Division I multi-sport conference, effective on August 1, 2013. Its nucleus is composed of the "Catholic Seven" members of the original Big East Conference: DePaul University, Georgetown University, Marquette University, Providence College, Seton Hall University, St. John's University, and Villanova University. In December 2012, these schools chose to split from the football playing schools in order to focus on basketball, and in March 2013 reached a settlement, whereby they acquired the Big East Conference name, logos, and the rights to the men's basketball tournament. Butler University, Creighton University, and Xavier University also joined the conference on its July 1, 2013 launch date. The football-playing members of the old Big East, along with several other schools, formed the American Athletic Conference, which retains the old Big East's charter and structure. However, both conferences claim 1979 as their founding date. As part of the separation agreement, the basketball schools were able to retain the basketball records while the football schools retained the football records respectively. Val Ackerman, former WNBA president, has been commissioner since June 26, 2013. On the same day Ackerman was named as commissioner, it announced that it will be headquartered in New York City. None of the conference's schools sponsor varsity football in the top-level Division I FBS. Georgetown, Villanova, and Butler do operate football programs in the second-level Division I FCS, though only Villanova offers scholarships to its players. The original Big East Conference was founded in 1979, when Providence College basketball coach Dave Gavitt spearheaded an effort to assemble an east coast basketball-centric collegiate athletic conference. The core of the Big East formed when Providence, St. John's, Georgetown, and Syracuse invited Seton Hall, Connecticut (UConn), Holy Cross, Rutgers, and Boston College (BC). Holy Cross turned down the invitation, as did Rutgers initially, while BC, Seton Hall, and UConn accepted. Gavitt became the Big East's first commissioner, and Villanova and Pittsburgh joined the conference shortly thereafter. PR firm Duffy & Shanley is credited with the initial branding and naming work for the conference. The conference remained largely unchanged until 1991, when it began to sponsor football, adding Miami as a full member, and Rutgers, Temple, Virginia Tech, and West Virginia as football-only members. Rutgers and West Virginia upgraded to full Big East membership in 1995, while Virginia Tech did the same in 2000. Notre Dame also joined as a non-football member effective in 1995. Temple football was kicked out after the 2004 season, but rejoined in 2012 and intended to become a full Big East member in 2013. The conference reorganized following the tumultuous period of realignment that hobbled the Big East between 2010 and 2013. The Big East was one of the most severely impacted conferences during the most recent conference realignment period. In all, 14 member schools announced their departure for other conferences, and 15 other schools announced plans to join the conference (eight as all-sports members, and four for football only). Three of the latter group later backed out of their plans to join (one for all sports, and the other two for football only). 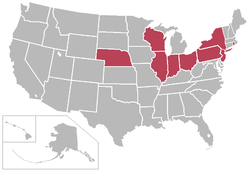 On December 15, 2012 the Big East's seven non-FBS schools, all Catholic institutions – DePaul, Georgetown, Marquette, Providence, St. John's, Seton Hall, and Villanova – announced that they had voted unanimously to separate from the Big East football playing schools, effective June 30, 2015. Among the many rumor-fueled news stories, it was reported that the so-called Catholic 7, in leaving the Big East, were looking for a more lucrative television deal than they would have received by remaining with the football schools. Of more concern may have been the limited window in which these non-FBS schools would hold a voting majority in the conference—after the defection of certain FBS schools to the ACC but before the effective inclusion of candidate FBS schools to replace them—and, therefore, architect a conference future both aligned with their institutional interests and true to the basketball roots from which the Big East grew. Five of the seven schools constituted a majority of the conference during its enormously successful early years, prior to the inclusion of football as a conference sport; only one of the FBS schools that were to remain in the conference, UConn, shared this heritage. In March 2013, it was announced that the Catholic 7 were not only parting ways with the FBS schools on June 30, 2013, but that they would retain the Big East name, $10 million from the old conference's treasury, and the right to hold the conference's basketball tournament at Madison Square Garden. On March 14, 2013, it was reported that the Big East would be adding members in the next seven to ten days. The following day, ESPN stated that the Big East would add Butler and Xavier from the Atlantic 10 Conference, as well as Creighton from the Missouri Valley Conference, with an official announcement to be forthcoming within the next week, although the institutions which were reportedly joining were refusing to comment. At a news conference in New York City on March 20, 2013, the reorganized league was formally introduced with Butler, Xavier, and Creighton included as members. Additional announcements included details of new contracts for television and for the use of Madison Square Garden as site of the men's basketball tournament. It billed itself as a return to Gavitt's original vision of a strong, Northeast-based basketball conference. During May 2013, the conference added several associate members in lacrosse and field hockey. The University of Denver joined the men's lacrosse league and started play in the 2014 season, while Rutgers University men's lacrosse played the 2014 season in the Big East before moving to the Big Ten in 2014–15. Rutgers also housed its field hockey and women's lacrosse teams in the Big East for 2013–14 before joining the Big Ten, as did Louisville in advance of its 2014 move to the ACC. The 2013–14 school year also saw the arrival of Connecticut and Temple for both women's lacrosse and field hockey, Old Dominion for field hockey only, and Cincinnati for women's lacrosse only; all of these schools remain Big East affiliates in those sports. The launch of a women's lacrosse league in the Big Ten for the 2015 season caused the American Lacrosse Conference (ALC) to dissolve after the 2014 season; two Southeastern Conference teams that had been ALC members, Florida and Vanderbilt, joined the Big East as associate members in that sport. The most recent changes in Big East membership came during the 2015–16 school year. First, on December 8, 2015, the conference announced that Liberty and Quinnipiac would become associate members in field hockey effective with the 2016 season. Then, on May 3, 2016, the Big East announced that Denver, already an affiliate in men's lacrosse, would move its women's lacrosse team into the league in the 2016–17 school year (2017 season). In addition to the new associate members, full member Butler announced on October 21, 2015 that it would elevate its club team in women's lacrosse to full varsity status in the 2017 season and immediately begin Big East competition. All full members of the Big East are private institutions, and all are Catholic except for Butler. ↑ Does not include over 100,000 students enrolled in online programs. Since the American Athletic Conference did not sponsor lacrosse or field hockey, Rutgers and Louisville joined the Big East as associate members before joining the Big Ten Conference and Atlantic Coast Conference, respectively, in 2014. Since the relaunch of the Big East in July 2013, it has sponsored championship competition in ten men's and twelve women's NCAA sanctioned sports. Initially, seven schools were associate members in three sports. Two associate members departed in 2014 and were replaced by two new associates. In 2016, two new associates joined, and an existing associate member brought a second sport into the Big East. The 2013–14 season marked the inaugural season of the reconfigured Big East. Kicking off with media day at Chelsea Piers, the season started with much fanfare and excitement around the country's elite basketball-centric conference. Aided by the lucrative TV agreement with FS1, almost all Big East games were televised, helping to maintain and grow Big East basketball as a national brand. For 2014–15, the Big East had four schools ranked in the top 20 and six schools in the top 30 recruiting classes nationally according to ESPN, Scout and Rivals rankings. Villanova won the conference's first national championship since realignment in 2016. This list goes through the 2015–16 season. All full Big East member schools field men's soccer teams. Big East men's lacrosse is made up of charter members Georgetown, Marquette, Providence, St. John's, and Villanova, as well as Denver. NCAA regulations state that there must be six teams for a league to receive an automatic bid to the NCAA tournament, and since Butler, Creighton, DePaul, Seton Hall, and Xavier only field club teams, the Big East had to look elsewhere. Both Denver and Johns Hopkins were rumored as targets for potential invitation and Denver was ultimately invited to join the Big East as a lacrosse-only member. Denver joined the Big East as one of the hottest teams in the country; at the time of the relaunch of the Big East in July 2013, the Pioneers had made six NCAA Tournament appearances in the previous eight seasons and had appeared in two Final Fours in the previous three seasons. The University of Denver houses most of its other sports in The Summit League; most of that league's other teams are closer to that school's Denver campus than the bulk of the Big East. There is still uncertainty to whether or not Butler, Creighton, DePaul, Seton Hall, or Xavier will elevate their programs from the club level, or if any other programs will receive lacrosse-only invitations. Big East full member schools, Butler, Creighton, Georgetown, Seton Hall, St. John's, Villanova and Xavier all field men's baseball teams. DePaul and Marquette have never fielded Big East baseball teams, while Providence fielded one until the late 1990s when it was dropped and later replaced with Lacrosse. Big East swimming & diving is made up of charter members Georgetown, Providence, Seton Hall, Villanova and Xavier. Villanova men's cross country team won three straight NCAA National Championships in 1966, 1967 and 1968, as well as a fourth in 1970. They also finished 2nd in 1962 and 1969. Providence men's cross country team have also finished in second in 1981 and 1982. † = Associates Connecticut, Liberty, Old Dominion, Quinnipiac, and Temple. †† = Associates Cincinnati, Connecticut, Denver, Florida, Temple, and Vanderbilt. The Big East began sponsoring field hockey in 1989, but conference records only indicate that a postseason tournament was held; the first recorded season of full league play was 1993, with Boston College, Connecticut, Georgetown, Providence, Syracuse, and Villanova participating. Georgetown left Big East field hockey after the 1994 season, and was replaced by incoming Big East member Rutgers. The next change in field hockey membership came in 2005, when BC left for the ACC and was replaced by Louisville. Georgetown returned its field hockey program to the Big East the next year, after which the conference's field hockey membership remained unchanged until the 2013 conference split. Shortly before the split, Old Dominion was set to join the original Big East as a field hockey associate. The conference split left both successor leagues—the reconfigured Big East and The American—with too few field hockey members to qualify for an automatic NCAA tournament berth. As a result, both leagues agreed that only the "new" Big East would sponsor the sport, and that all American members with field hockey programs would become associates. Accordingly, the Big East field hockey conference would now be made up of Big East full members Georgetown, Providence, and Villanova; American members Connecticut, Louisville, Rutgers, and Temple; and Old Dominion, otherwise a member of Conference USA. Following the 2014 departure of Louisville and Rutgers for all-sports membership in conferences that sponsored field hockey (respectively the ACC and Big Ten), Big East field hockey operated with six members until Liberty and Quinnipiac joined as associate members in 2016. UConn had two national titles and two runner-up finishes as a member of the original Big East, but before the conference established a field hockey league. Old Dominion had nine national titles and three runner-up finishes before joining Big East field hockey. Big East swimming & diving is made up of charter members Butler, Georgetown, Providence, Seton Hall, Villanova and Xavier. All full members of the Big East sponsor women's volleyball. However, in the first season of the reconfigured Big East in 2013, Providence was an affiliate member of the America East Conference. The Friars joined Big East volleyball in 2014. The Providence women's cross country team have been crowned NCAA National Champions in 1995 and 2013, as well as finishing 2nd in 1990 and 2012. The Villanova women's cross country team won two straight NCAA National Championships in 2009 and 2010 and six straight NCAA National Championships in 1989, 1990, 1991, 1992, 1993, and 1994. Villanova runners also won an individual NCAA National Championship in 1998, as well as placing 3rd in 1995, 2nd in 1996 and 3rd in 2011. The Georgetown women's cross country team were NCAA National Champions in 2011. The Big East began sponsoring women's lacrosse in the 2001 season with Boston College, UConn, Georgetown, Notre Dame, Rutgers, Syracuse, and Virginia Tech. The original lineup stayed in place until Virginia Tech and BC left for the ACC, respectively in 2004 and 2005. The conference replaced BC with Loyola (Maryland) for the 2006 season, and the Greyhounds remained an associate member until the school joined the Patriot League, which already sponsored women's lacrosse, in 2013. Originally, the conference championship was decided solely by league play; a postseason tournament was added starting in the 2007 season with the top four teams qualifying, a format that exists to this day. The next changes in women's lacrosse membership came in the 2009 season, when Cincinnati and Louisville (both of which had only added varsity lacrosse for the 2008 season) brought their teams into the Big East. Villanova followed in the 2010 season. As in the case of field hockey, the 2013 conference split left the Big East and The American with too few lacrosse teams for an automatic NCAA bid. Also in a parallel with field hockey, the two conferences agreed that only the reconfigured Big East would sponsor the sport, with all women's lacrosse teams from The American becoming associate members. The first season of women's lacrosse in the reconfigured league in 2014 would thus include Cincinnati, UConn, Georgetown, Louisville, new varsity team Marquette, Rutgers, Temple, and Villanova. The Big East would lose Louisville and Rutgers after that season, respectively to the ACC and Big Ten, replacing them with Florida and Vanderbilt (the only two SEC schools sponsoring the sport) after the demise of the American Lacrosse Conference. For the 2017 season, Butler will add varsity women's lacrosse and Denver will bring its women's lacrosse team into the league, giving the Big East 10 members in the sport. This list includes NCAA championships. Excluded from this list are all national championships earned outside the scope of NCAA competition, including Division I FBS football titles (0), women's AIAW championships (2 by Old Dominion), equestrian titles (0), and retroactive Helms Athletic Foundation titles (1 by St. John's). NCAA championships won by Big East associate members in their Big East sports are also included, but those schools' championships in sports that they currently house outside the Big East are excluded. These schools are indicated in italics. ↑ St. John's men generally play their Big East home schedule in Madison Square Garden and their non-conference home schedule on campus at Carnesecca Arena. In 2012-13, St. John's played only one non-conference game at MSG and two Big East games on campus. ↑ For certain high-profile home games, Villanova uses the Wells Fargo Center, and previously used the Spectrum. In 2005–06, Villanova played three home games at the Wells Fargo Center and the rest on campus at The Pavilion. In 2006, the Wells Fargo Center was also a first-round site for the NCAA Tournament. Under NCAA rules, a venue is not considered a home court unless a school plays four or more regular-season games there; this enabled Villanova to play its first two tournament games at the Wells Fargo Center (but Villanova was not considered the host school for that sub-region – the Atlantic 10 Conference was). This situation occurred again in 2009, with Villanova playing (and winning) its first two tournament games at Wells Fargo Center. ↑ Ewart, Brian (May 2, 2013). "NCAA Division I Board recognizes New Big East as a conference". VU Hoops. Retrieved July 16, 2013. ↑ Bachman, Rachel (March 8, 2013). "It's Official: Big East, Catholic Schools Split". The Wall Street Journal. Retrieved March 8, 2013. 1 2 Staff (March 20, 2013). "New Big East adds Butler, 2 others". ESPN. Retrieved March 20, 2013. ↑ Katz, Andy (June 26, 2013). "Big East hires Val Ackerman as chief". ESPN.com. Retrieved June 26, 2013. ↑ McNamara, Kevin (March 20, 2013). "Big East office will be based in New York". The Providence Journal. Retrieved March 23, 2013. ↑ Soshnick, Scott; Kercheval, Nancy (March 20, 2013). "New Big East Adds Butler, Creighton, Xavier; Fox TV Deal". Bloomberg Businessweek. Retrieved March 23, 2013. ↑ Dana O'Neil & Conor Nevins (March 12, 2013). "Last Call For A Garden Party". ESPN. Retrieved 18 October 2016. ↑ Robbins, Lenn (March 4, 2013). "New Big East heavenly for hoops fans". The New York Post. Retrieved May 30, 2013. ↑ Blaudschun, Mark (March 8, 2013). "Naming original Big East was simple". AJerseyGuy.com. Retrieved March 9, 2013. ↑ Crouthamel, Jake (December 8, 2000). "A Big East History and Retrospective, Part 1". SUAthletics.com. Retrieved March 9, 2013. ↑ Sarah Maslin Nir (September 17, 2011). "Dave Gavitt, the Big East's Founder, Dies at 73". The New York Times. Retrieved March 9, 2013. ↑ "Big East, Villanova Make It Official". The Pittsburgh Press, via Google News. United Press International. March 13, 1980. Retrieved March 9, 2013. ↑ Hanley, Richard F (November 19, 1981). "Pittsburgh To Join Big East". Record-Journal. Google News. Retrieved March 9, 2013. ↑ Scott Soshnick (March 28, 2013). "Darth Vader Inspiration Can Guide Big East Pick New Name". Bloomberg. Retrieved 18 October 2016. ↑ "Big East Football Timeline". Philly.com. March 8, 2008. Archived from the original on August 27, 2012. Retrieved March 9, 2013. ↑ Thamel, Pete (May 7, 2012). "Commissioner John Marinatto Steps Down Amid Big East's Instability". The New York Times. Retrieved March 9, 2013. ↑ "Big East 'unwilling' to meet terms". ESPN. January 3, 2013. Retrieved March 9, 2013. ↑ "Seven schools leaving Big East". ESPN. December 15, 2012. Retrieved December 15, 2012. ↑ Rovell, Darren (January 6, 2013). "Sources: 'Catholic 7' eyes big TV deal". ESPN. Retrieved March 6, 2013. ↑ Harten, David (March 5, 2013). "Catholic 7 has framework to keep Big East name, MSG as tourney site". NBC Sports. Retrieved March 7, 2013. ↑ Katz, Andy. "Source: Other members coming soon". ESPN. Retrieved March 16, 2013. ↑ Katz, Andy. "Sources: Big East at 10 for 2013-14". ESPN. Retrieved March 16, 2013. ↑ Liz Clark (March 19, 2013). "'New' Big East prepared to make its formal introduction". Washington Post. Retrieved March 20, 2013. ↑ Chambers, Mike (May 30, 2013). "DU Pioneers men's lacrosse team leaving ECAC for Big East next season". Denver Post. Retrieved July 16, 2013. ↑ "Rutgers Men's Lacrosse to Join Newly Formed Big Ten in 2014-15". Rutgers Scarlet Knights. June 3, 2013. Retrieved July 16, 2013. ↑ Ewart, Brian (May 1, 2013). "Temple Joins New Big East In Lacrosse, Field Hockey". VU Hoops. SB Nation. Retrieved July 16, 2013. ↑ "Vanderbilt joins Big East for lacrosse". The Tennessean. Nashville. Associated Press. June 26, 2014. Retrieved July 1, 2014. ↑ "Denver Added To BIG EAST Women's Lacrosse Lineup" (Press release). Big East Conference. May 3, 2016. Retrieved May 4, 2016. ↑ "Butler Adds Women's Lacrosse as University's 20th Varsity Sport" (Press release). Butler Bulldogs. October 21, 2015. Archived from the original on March 29, 2016. Retrieved May 4, 2016. ↑ "BIG EAST Field Hockey Record Book Through 2014 Season" (PDF). Big East Conference. Retrieved January 17, 2016. ↑ "Year-By-Year Results" (PDF). 2016 Cincinnati Lacrosse Media Guide. Cincinnati Bearcats. p. 49. Retrieved May 5, 2016. ↑ "Year-By-Year Results". 2016 Louisville Lacrosse Media Guide. Louisville Cardinals. p. 62. Retrieved May 5, 2016. 1 2 "2016 Big East Women's Lacrosse Record Book" (PDF). Big East Conference. Retrieved May 5, 2015. ↑ "St. John's 2012-13 Men's Basketball Schedule" (PDF). St. John's Red Storm. December 6, 2012. Retrieved July 16, 2013. Wikimedia Commons has media related to Big East Conference.